Fully submersable water and air pump. 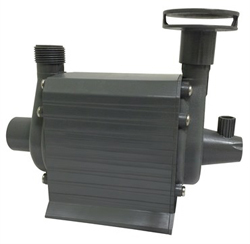 Dual-impeller design pumps water on one end and generates oxygen on the other. Pumps 1200gph of water and a 20ft sug-off. Aerates ponds up to 1000 gallons at 2ft depth. Only one outlet is needed for both water and air.